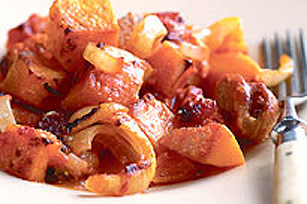 Our hearty Roasted Vegetable Stew is a simple medley of oven-roasted sausages, peppers, onions and squash. This 6-ingredient stew gets a boost of flavour from Caesar dressing. Pre-heat oven to 400°F. Combine 6 pre-cooked, well-drained, chopped Italian sausages with 2 chopped peppers, 1 sliced onion and 3 cups cubed squash in a 9 x 13 inch baking dish. MIX 3/4 cup Kraft Creamy Caesar Dressing and 1 cup tomato sauce and pour over dish. BAKE for 45 minutes or until vegetables are tender. To save 80 calories and 9 g fat substitute Kraft Calorie-Wise Caesar Dressing.